I've been thinking lovingly about Universal Studios (this happens regularly throughout the day) and also about Universal Monsters (this also happens regularly throughout the day). Being Halloween and all, I felt it fit to talk about my favorite restaurant at the park (Krusty Burger comes in a close second though). 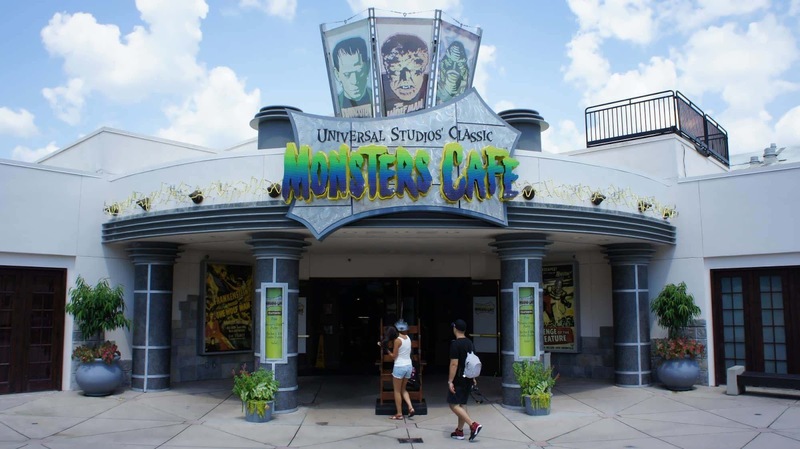 Monsters Cafe is located near Shrek 4D building not far away from the entrance of the park and is wonderful. First of all, the place is decked out with Frankenstein and all his pals. Not just that cool sign on the building and neat-o statue that grabs your attention before you get close. Inside the restaurant, you're immediately greeted by dioramas of the monsters behind glass. Well done, true to scale representations of the gang right there in your face. However, this is more than a cool sign and a few displays. The inside of the restaurant's seating is separated into different sections inspired by each monster. Yes, you can eat a pizza in Dr Frankenstein's lab. Yes, you can have a salad in the Creature from the Black Lagoons boating dock. You can have chicken tenders at the Wolfman's crib. Or if you're like me, you can eat a monster burger in Dracula's Castle. A Monster Burger? Oh yeah mofo, a monster burger (that's actually just what I call it, because I'm fun to be around). Picture this, a big ol burger with not just cheese and lettuce... BUT PULLED PORK BBQ! While I would have happily enjoyed a lounge or a museum of sorts dedicated to the Universal Monsters, a restaurant with really good food is something I desire even more on vacation. Monsters Cafe is a Quick Serve restaurant, so if you have that dinning plan, it's totally compatible (and I'm a burger and fries kinda guy). While I'm not sure exactly when I'll be able to make it back to the extra most best-est place in the universe (hopefully 2019, we're planning to do a Halloween vacation at Disney World next year), I know exactly where I want to eat!